Welcome to wage-peace.org, a resource and listing centre representing several Alberta-based peace and antiwar activist groups. Our collective mission is to end the occupations of Iraq and Palestine which have resulted in the deaths of thousands of civilians. We also seek to end racial profiling and civil liberties clawbacks at home, and stop new wars from being waged in our names under the guise of a "war on terrorism." We are in the process of building a new site. Current information on March 20 events can be found on ecawar.org. Events organized by ECAWAR are now being updated at www.ecawar.org. Please go there for the defintive update on March 20 events in Edmonton. March 20, 2004 marks one full year since the start of the war on Iraq. Since then, thousands of innocent Iraqis have been killed, no weapons of mass destruction have been found, and democracy is nowhere in sight in “liberated” Iraq. Everything the anti-war movement said last year has proved correct. Now, one year later, the anti-war movement is back to say “The World STILL Says No to War”! March 20 has been endorsed in countries all over the world as the next global day of protest to mark the one-year anniversary of the Iraq War. March 20 has been endorsed in countries all over the world as the next global day of protest to mark the one-year anniversary of the Iraq War. Thousands of anti-war campaigners at the European Social Forum and the 2nd International Cairo Conference have already endorsed March 20 and it was recently endorsed at a special global anti-war assembly at the World Social Forum in Mumbai, India. ECAWAR (Edmonton Coalition Against War and Racism) is having a special general meeting 7-9 p.m on Sunday, February 8 at the Mennonite Centre for Newcomers. Working groups will be established for planning and publicizing the march and rally for March 20, 2004 to mark the one year anniversary of US/UK bombing and subsequent illegal occupation of Iraq. Volunteers welcome. For more information and contacts, call (780) 988-2713. If Canada joins the Bush administration’s National Missile Defense (NMD) system, we may never be able to lay claim to being an international player for peace. Canada signing on will result in the joint weaponizing of space, proliferation and development of new nuclear weapons — a disaster for Canada’s foreign policy independence. Yet NMD has Paul Martin’s approval and may be approved as a fait accomplit shortly after his talks with George W. Bush. Some upcoming events are taking place concerning what to do about NMD, and their organizers invite all to attend. MEETING—National Missile Defense (NMD) Committee, at Roots. TALK—The National Missile Defense Plan: Consequences for Canadian Indepedence, at the U of A (during International Week)— A talk by Mel Hurtig, author, publisher, activist. In U of A’s Engineering Teaching and Learning Complex , Room 1-007. Click here for more information. Next general meeting of the Edmonton Coalition Against War and Racism , Edmonton, at the Mennonite Centre for Newcomers (#101, 10010 - 107A Avenue). We’ll be discussing NMD in addition to other business. The University of Alberta Coalition against War and Racism has been meeting almost every Thursday since Sept. 11, 2001, to keep antiwar awareness, voices and resistance alive at the U of A. 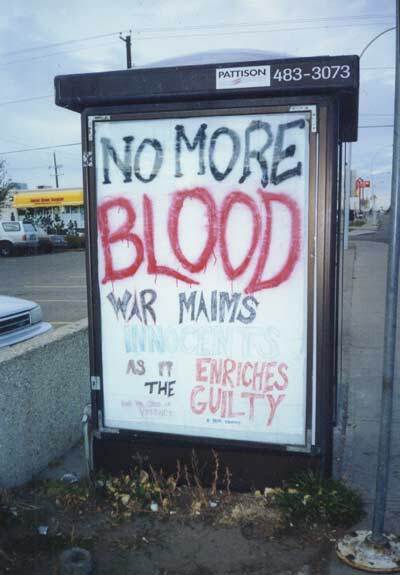 Early in 2003, we staged the first big Edmonton demos against war on Iraq, before initiating the city-wide anti-war coalition (ECAWAR). Recently, we staged two Palestine awareness events. Several key organizers have moved on to other cities in Canada and the U.S., and we need more participation. 2004.Feb.14 John Kerry tells antiwar protestors to "get over it"
U.S. establishment Democrats have been pushing its own dangerous brand of "U.S. hegemony" but with much less fanfare. Beset by massive reconstruction needs, authorities have given the country's first environment minister a budget of just one million dollars this year to start tackling Iraq's massive environmental crises. Did Paul Martin just blink on missile defence? If you take a look at what the PM did in Monterrey last week, you might very well conclude he did. The federal government said yesterday that the odds of a missile attack against Canada are "low" but that it needs to negotiate a role quickly in the U.S.-led anti-missile shield because the threat "could increase" in coming years. wage-peace.org is maintained by the Peace Times Education Society and impossible without the help of The Edmonton Coalition Against War and Racism and Project Ploughshares Edmonton. A final decision on Canada's participation in U.S. National Missile Defense will be made in the coming weeks. Click here to visit ceasefire.ca where you may send an on-line fax to Paul Martin. Contact list for Alberta peace and international justice groups. Receive announcements for peace events in your email inbox. Submit your event, media releases, articles, & web links. The event calendar is no longer being updated on wage-peace.org. Please go to ECAWAR.org for updates on peace and antiwar events in Edmonton.